Fred Amata angry with Ibinabo over new baby? Handsome Nollywood actor Fred Amata is said to be sulking and complaining about his new born baby girl by the delectable actress and former miss wonderland, Ibinabo Fiberesima and described the baby as a Greek gift he never bargained for. We gathered that the serial mother on January 29th, 2008 delivered a baby girl for Fred Amata in London, but that Fred never hid his disappointment with the way and manner Ibinabo played her card. According to our source, Fred told Ibinabo that it was wrong for her to keep a pregnancy they did not plan for and suggested for an abortion which Ibinabo refused and insisted in keeping the pregnancy and now the baby has been delivered. 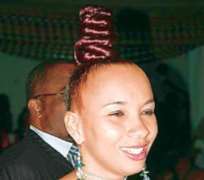 The source also said Fred should have gotten prepared for this knowing Ibinabo's antecedent. “She is now a mother for the third time, just check out the men she had the kids for and you know what I am talking about, three different men she ended up not marrying”. Although this is the first girl child for the beautiful Rivers State born actress who already has a two boys for TV guru Philip Trimnell, Fred on the other hand has daughter from his estranged wife Agather, the host of the popular TV talk show, 'Inside out'. It would be recalled that Fred Amata who we gathered recently won a N20m World Bank contract and the controversial Ibinabo became an item at a time both were battling for love. Fred battling to pick the pieces of a broken marriage to Agatha and Ibinabo battling to salvage what remained of a broken and shattered image after killing a medical doctor with her car in Lekki Lagos. The accident generated so much controversy that almost all her friends abandoned her, except Fred and a few others. The light skinned show biz personality came to limelight far back in 1991 when she was runner up in the miss Nigeria beauty pageant while her first stunt in acting was in the movie the “most wanted”.